As an Army wife, it feels strange writing about my own experience with PTSD. I do not take the experiences of veterans who have suffered from PTSD lightly. But the reality is that PTSD (Post Traumatic Stress Disorder) is more common than most people think. It doesn’t just occur as a response to being in war. Many people suffer from it as a result of life-altering events. More recently, educators are acknowledging their struggles with PTSD. 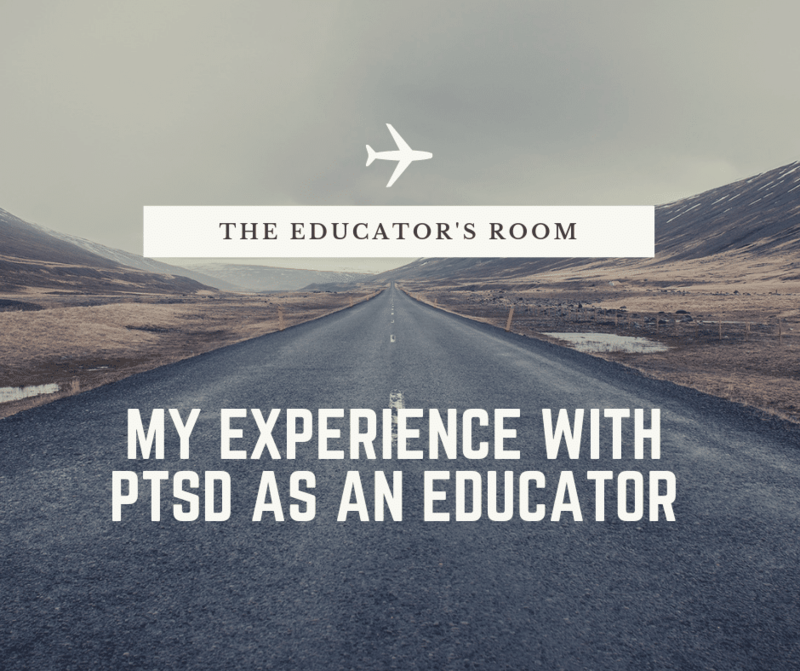 My own personal experience with PTSD started toward the latter part of the 2016-2017 school year. As a fifth-year teacher, I’d finally found my groove. I’d been working at this school for three years. I juggled various hats at the school including grade level chair, BETA club co-sponsor, an advisor for the girl’s mentoring group, the assessment contact for the school, and a member of the personalized learning committee. Most importantly, I was teaching the third-grade collab class. My students really were on varying learning levels. My lowest student was on a kindergarten reading level and my highest student was approaching sixth grade. I was absolutely overwhelmed with how to ensure that each student received what they needed. There was a special education teacher in my room for three-quarters of the day, but the workload was still too much to manage. The first half of the school year was incredibly demanding. All I can remember is meetings, assessments, data talks, repeat. I tried my best to stay on top of what was most important- teaching my students. Our planning time was limited. The little planning time I did have was filled with IEP meetings, collab meetings, and professional development. I felt like I couldn’t catch up and the demands were increasing. I had a student with significant mental issues who would often destroy part of my classroom and who would need to be restrained. Although he would shift the atmosphere of the classroom, I’d quickly draw the other students back on track. It was challenging performing when I wanted to just run away. The student was not getting the support HE specifically needed. Administration, although claiming they were on our sides, did not seem to care about what I was facing. When the letters of intent went out after the new year, rather than making a quick decision, I took the month to really think about what I wanted to do next school year. I knew that I couldn’t repeat another school year like this one. I talked to my husband and decided to take a leap of faith and resign for the next school year. Little did I know- this was the start of the worst semester yet. Admin started coming to my room for unannounced walkthroughs. They started nitpicking about everything. I was often summoned to the office for what was perceived to be a lack of engagement. I was accused of not caring as much as I did when I first started. Mind you, I was voted teacher of the year. I was competent and passion. I’d proven myself as a professional. When I decided to take a day off to go to the doctor (since I’d been putting it off because I didn’t want to use MY SICK days…), an administrator called me one evening and reprimanded me for not informing them before I requested the sick day. Imagine my confusion. I had never done that before. But I let it go. I was seeing a therapist at this time. She strongly encouraged me to complete FMLA paperwork in order to take time off. She was concerned about me and even considered referring me to a psychiatrist. I fought it. I didn’t want anyone at my school to know that I needed counseling and was struggling with anxiety and depression. Over the next few months, things got worse. I ended up going to the ER by ambulance because I had my second panic attack since working at this particular school. This was concerning to both my husband and I because I’d never had panic attacks before. Despite this situation, the administration did not care. The expectations were still high. They still came in my room. My grade level was often on the hot seat because of common assessment scores. Time and time again, I had to prove myself and justify everything. It was exhausting. As a recovering perfectionist, I was constantly questioning myself: “why is this so challenging? What’s wrong with me?” Since turning in my resignation letter, there was thick tension between the administrators and I. It was even more noticeable to me because of my professional relationship with my principal was previously excellent. I looked up to her and considered her a mentor. My feelings started to be hurt. I had several crying spells while at work. Each day, I would dread going to work and cry before leaving the house. Daily, my husband reminded me “it’s almost over.” The months of March, April and May went by slowly. Test prep was in full effect. Our lesson plans were looked at with a fine tooth comb. The micromanaging was mind-boggling. Many of my coworkers were concerned about me because of the constant dread and emotion I displayed. It was harder and harder to even pretend like everything was okay. As the end of the year approached and I began packing my room. My husband, who would be deployed soon, starting coming to my room to pick up my things so that I wouldn’t have to do it all alone. I specifically remember running into one of the admins as we were rolling stuff outside. All she could do was stare at everything. My things were in clear bins, so there was nothing to hide. A few days later, she sent an email saying there would be a checklist of classroom supplies we’d have to sign off on before leaving for the school year. I couldn’t believe the level they’d stooped to. When the very last day of post planning came and went, I cried. I’d carried so much hurt, frustration, disappointment, and stress. I couldn’t believe it was finally over. Although about eight months have passed since I finished the school year, I still have overwhelming anxiety about returning to the classroom. I still have mental images of the various stressful episodes from last school year. Because I know I’m still committed to the education field, I have started doing the work to heal. I’ve been attending counseling and other professional developments that fuel me. I’ve invested in my health and wellness. One of the biggest lessons I learned in that no one is in control of my wellness other than me. It is my responsibility to know when to walk away from something that doesn’t feel good to my soul. Educators, I encourage you to take inventory of how you are truly doing. Don’t allow fear of the unknown to keep you in a position that’s slowing killing your spirit. You are worth being taken care of. You are worth investing in. Please learn from my experience and know when to walk away, even if it is only temporary.